Now we can really consider this trip to completed successfully. Our Cessna is well and back in its home hangar and both pilots are alive. Who would have thought that? When we could not complete the approach into Heubach with visual flight rules (there is no instrument approach unfortunately) and decided against landing in Stuttgart, we had to park the Cessna in Friedrichshafen at the Lake of Constance. Today it was time to bring back the bird. When the mission is to get up early on a Sunday and take responsibility for an important task, it is clear that Achim has to step in. Markus was still trying to sober up from yesterday's binge drinking before getting up for his kebap breakfast at 12 o'clock in Stuttgart. Achim boarded the metro at 08:34 and arrived at Friedrichshafen Airport around 11 o'clock where it was still cloudy, unlike in sunny Stuttgart. To great surprise, the airport was vibrating as it recently has become the hub of ski fanatic Brits: three airplanes from London all arriving within one hour! 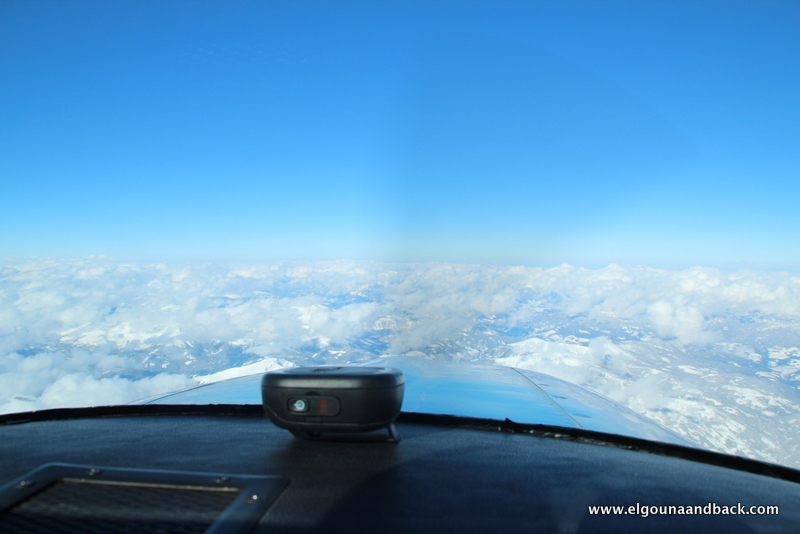 The flight back was just a short hop of 30 minutes and after takeoff lead us south west over the Lake of Constance, climbing through the clouds to blue skies and on direct course to Heubach. 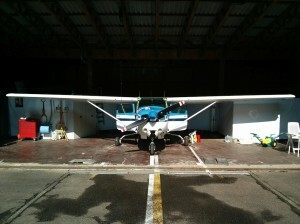 After landing, the Cessna was stored in the hangar and tidied up a bit. The real interesting question is how we are going to get rid of the Sahara sand which was pressed into every corner and wrinkle when we flew back to Greece. This trip went way too smooth. Neither technical nor any other problems lead to the desasters that our scandal loving readership expected. After an additional day of spa wellness in Dubrovnik, the stars promised luck for today's leg home. 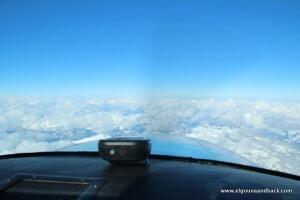 Few clouds enroute, mostly blue skies north of the Alps and a broken layer of clouds at our destination. The icing on the cake was a strong tailwind so we were convinced our last leg was going to be a home run. The first two hours were just like we expected, maybe a few clouds more than forecast but 30 knots of free thrust from behind. North of the Alps no clouds, just a bit of mist. Starting at the Danube Valley the situation changed completely: an overcast cloud layer at about 8000 feet and a bit later another layer of clouds on top. We continued to our destination Heubach (50km east of Stuttgart) at 10 000 feet, hoping to find a hole in the clouds allowing us to change from IFR to VFR (visual flight rules). Our backup strategy was to continue north to Schwäbisch Hall, slide down the ILS (instrument landing system) through the clouds and continue visually to Heubach. Overhead Heubach we had a short discussion with Jörg Lohmann on the tower and it was clear that we would not land there today. So we continued to Schwäbisch Hall. The colleague there just told us "forget it, 400 feet cloud cover, no way to make it to Heubach". Not great either. So on we go to Stuttgart, still reporting a broken cloud layer 1200 feet above the runway. Stuttgart Airport is not cheap but from there we can take the metro. Air traffic control was very supportive and allowed us to continue at 8000 feet (outside clouds) to the instrument landing system of runway 25 in Stuttgart. When it was time to descend, we saw once again an overcast cloud layer which appeared to be rather thick. 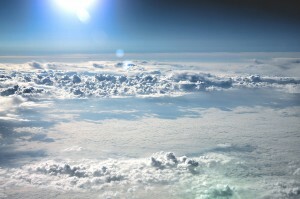 We could descend through the cloud layer but would pick up some ice and might have a problem if we have to go around. We were allowed to hover around the airport looking for the reported holes and the controller asked airplanes in the vicinity for holes but nothing. The controller on the tower of Stuttgart also reported an overcast layer. The weather report for Stuttgart was definitely wrong which is quite scandalous as pilots have to rely on it. Now we were out of preplanned options and had to look for something else. We had good weather coming from the south and it was getting worse the more north we got so we had to return south. The DFS controller was extremely professional and first asked for our endurance to judge the options and urgency. 3.5h so no problem at all. 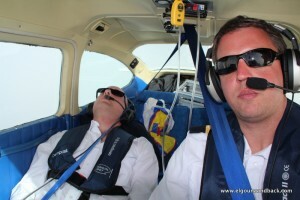 We discussed possible aerodromes, contacted Mengen but were told there is the same overcast cloud layer. While discussing other options, the controller contacted us and told us he spent some time phoning airports and recommends Friedrichshafen (EDNY, Lake of Contance) with blue skies. This was the perfect solution: only 20 minutes away, fully equipped with an instrument landing system, excellent infrastructure, customs and reasonable prices. So we continued to the beautiful Lake of Constance, were put on the ILS runway 24 by Swiss Air Traffic Control and landed with excellent weather. The aircraft was tied down, we passed immigration, had a little snack and reevaluated our options. We did not expect conditions in Heubach to improve today and the short jump to Stuttgart would help much (other than increasing the cost). So we got a rental car and took off to Heubach where Markus's car is waiting in the hangar. The real final of this journey will be in a few days when Achim takes the train to Friedrichshafen and brings the Cessna home to its hangar in Heubach. By this time, Markus will be sitting in his cube farm working on support tickets. The worst case that everybody feared has happened: we are stuck in Croatia. Markus determined that the weather is a no go and is looking forward to the excellent weather forecast for Monday. In reality, the weather is definitely doable without taking risk. An important role in this decision played the fantastic spa of the hotel and the view from our hotel room. Achim is now forced to look at Markus’s wobbly body for a whole day and find a way to get the work schedule for Monday done on a Sunday in a hotel room. A little background in flight planning for our non pilot friends. The weather is the main factor her and wind (mostly determining our speed over ground) and the the different types of clouds are most important. 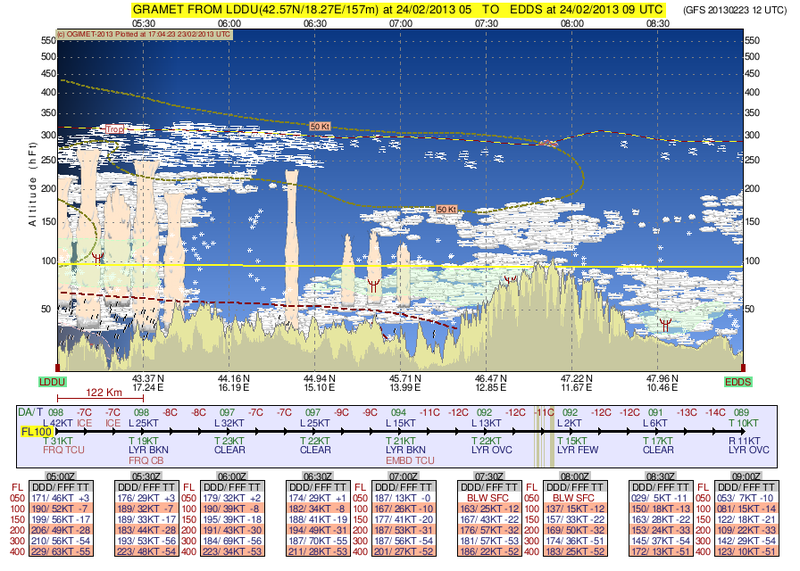 For planning our route, we have gotten to like a chart called “GRAMET” which is a prognosis based on a computer weather model (GFS) and giving an aeronautical weather forecast for a specific route. The above example shows the GRAMET for our planned trip from Dubrovnik (LDDU) to Heubach (EDTH). As Heubach isn’t really of international relevance and does not have a weather station of its own, we selected Stuttgart (EDDS) as our destination — just around the corner. On the picture you see the profile of the surface, showing that our journey starts at sea elevation (0 feet), leads us over the Alpa and later the Swabian Jura. The highest elevation is somewhere in the Alps at roughly 10,000 feet (3,300 meters). The red dotted line represents the 0°C border. You can see how it moves lower as we get further north. Also you can see the different layers of clouds and their types. On the left you see a few towering cumuli, those are clouds of large vertical extent one tries to avoid due to strong up and down drafts — meaning turbulence. Also there is precipitation forecast in Dubrovnik. The green areas with the strange read symbol mean that there is danger of icing meaning there are water droplets with less than 0°C waiting for a Cessna to come so they can instantly freeze and stick to the leading edges. Not the best thing for us as we don’t have deicing equipment like airliners, meaning we cannot get rid of the ice and therefore get heavier and less aerodynamic and at some point would no longer be able to hold our altitude. You can also see that for some areas we would expect clouds from the surface up to flight level 200. 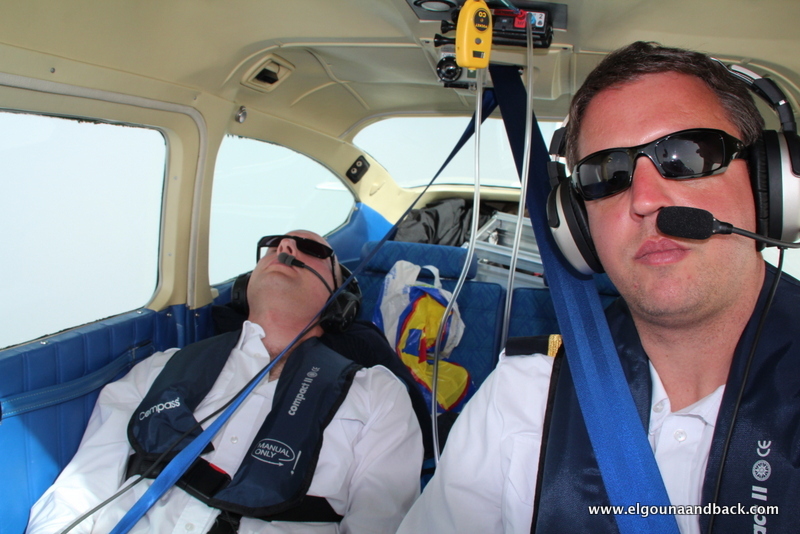 In principle, clouds are no problem but flying inside clouds for hours isn’t very entertaining and with one engine there is always the theoretical danger of a failure and being able to see the surface and finding an emergency landing spot is a great advantage. All in all not the optimal weather. We should be able to take off avoiding the towering cumuli but with the Alps inside clouds a technical problem would turn into a huge problem. In addition to that icing on the north side of the Alps where at some point we’d have to descend for landing. So we have to look at different route alternatives (for example going further west via Italy where the weather should be better), hope for a positive surprise or stay grounded tomorrow. The latter option isn’t the worst one considering the fantastic spa of our hotel (besides the fact that I’d have to visit it together with Achim). Once again we got lucky with the weather: taking off from Iraklion we flew of the Greek Island and Albania back to Croatia where we just touched down in excellent weather. 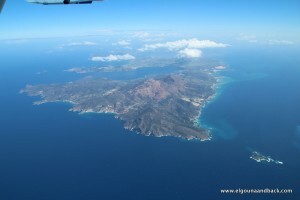 The enroute weather was good, only in Greece we flew over an overcast cloud layer at 14 000 feet for about one hour. Today's leg was the longest so far: thanks to a strong headwind it took us about 5 hours. 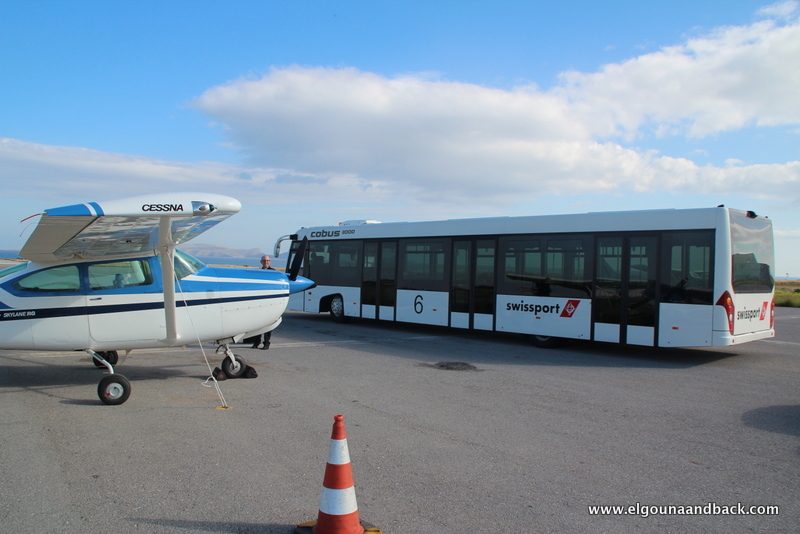 Our departure from Iraklion got a bit delayed due to administrative hurdles. Several times, they pointed out the the lack in staff as the reason for the issues. We were unable to verify this as every office was manned by at least four persons and for every task like refueling or driving us over the tarmac were executed by at least three employees. Our highlight was the taxi from the terminal to the handling agent's office: three handling agents drove in their Fiat at walking pace while we tried to follow behind carrying our luggage. Paying our landing fees was not easy at all. The handling agent (a different one but almost as pretty) led us through a maze of marble floor hallways to a locked office with a Greek sign hanging on the door knob saying something like "I don't feel like working"). After about 15 minutes of communication via mobile and radio and the arrival of several officials, the responsible person finally arrived and invited us into his office. There he wanted to know a lot of things that he as airport official should know best (e.g. our arrival time the day before) which he entered into his DOS program and printed out using two dot matrix printers on forms with carbon copy. The end result of the exercise was a invoice about € 1.37 — due in cash and without change. 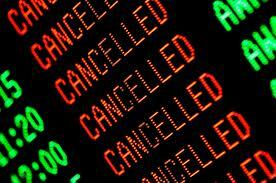 Our handling agents then wanted another € 33 — in cash and without change. Normally it's the job of the handling agent to take care of such administrative tasks but — as mentioned before — they were short on staff. Refueling worked without any problems and even though we were told the amount was due in cash without change, they accepted our credit card. Touch down Iraklion! Who would have thought that our plan worked out without a hitch! At an ungodly hour with the first sun rays we departed El Gouna on the Read Sea, heading north to the pyramids and "6th of October". 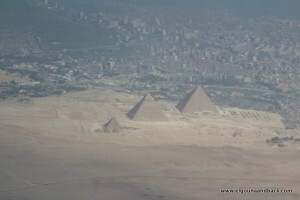 Only there in Egypt you can find the special type of fuel that our aircraft requires. The landing was once again extremely windy with 30 knots (about 60kp/h, something we specialize in by now) but a real greaser. The fuel bowser was a bit oversized for our aircraft but after about half an hour we were ready for depature again and continued our journey north via the pyramids crossing Cairo and going to Port Said. The following landing was one of the easiest, only olfactorily and visually complicated by the smoke of burning cars from the protests. Just in time for the Friday's Prayers after which — as you know from TV and radio — the riots start, we had passed immigration, talked to the airport manager, had tea with the immigration officer and thanked Ahmed for his great help during the whole trip. 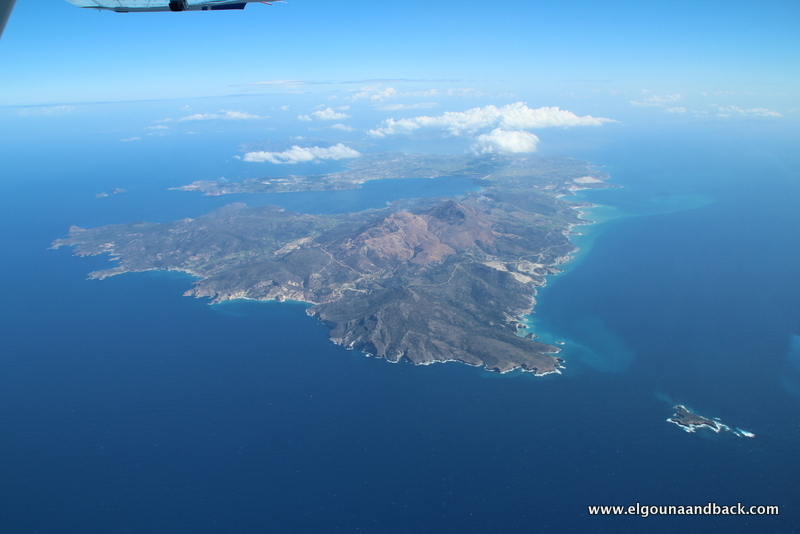 The flight plan which we had submitted did once more not arrive at the Egyptian air traffic control unit but even that was no issue and about 1.5 hours after our landing we were airborne again, heading north over the Med. 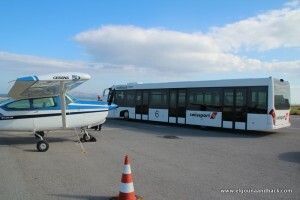 We decided to divert to our alternate Iraklion to avoid another landing in Sitia with 60kp/h crosswinds. The approach into Iraklion led us through layers of clouds and rather bad visibility (due to the southerly winds bringing loads of Sahara sand from Africa) and we were only able to see the runway when we were right above the threshold. Thanks to a nose dive we managed to land on the first attempt and after a lovely handling service (see pictures) we are now happily sitting in our hotel room and planning tomorrow's leg into the cold north. Exactly a week ago our adventure started in cold and snowy Southern Germany. 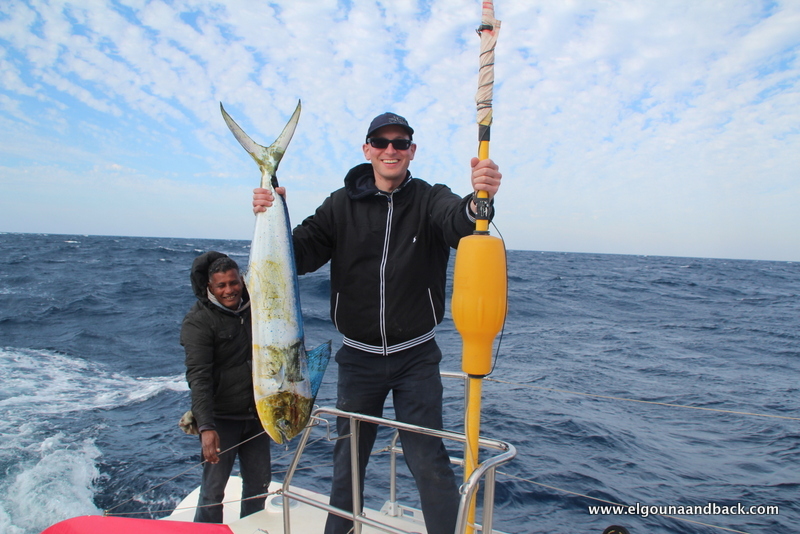 After a smooth flight in excellent weather (apart from the gusts on Crete), we had a few sunny days in El Gouna at 25C and spent time in the pool, wakeboarding, a breakneck sailing tour with a professional crew, big fish and snorkeling at the reef. Tomorrow we'll head back to the cold north and planning is currently underway. Right now it looks like we'll takeoff at El Gouna flying to October (the name of the town is "6th of October", yes such names really exist), fill up the fuel tanks there with AVGAS (the high quality aviation fuel for piston engines, only availble in October), then another 2 hours to Port Said for immigration and customs (hoping that it will stay calm after the Friday's Prayers) and from Port Said 3.5h over the Med to our windy island Crete. Tomorrow's trip is planned rather ambitiously and will only work out as planned if nothing unexpected happens. We want to takeoff at 6:30h local time to make it to Port Said via October as early as possible, hoping that there will be no delays and we can takeoff to Crete as planned as the Greek close their airport on Friday rather early (yes, even airports have official opening hours and when missing the deadline, one has to look for other landing options, in our case Iraklion). On paper it should work out just fine but there is an Egyptian uncertainty factor in all of this. May Allah bless our endeavor. From there on, it's a big unknown at this point. Currently the winter is coming back with really bad weather over Central Europe and our next destination Dubrovnik is expecting terrible weather with thunderstorms and strong winds on Saturday — not exactly great conditions for a light aircraft. As it is hard to predict the actual weather conditions at this time, we are taking one leg at a time and will evaluation our options as we arrive. We might have to fly west via Italy or east via Eastern Europe — or get stuck and wait. We shall see and we will report here — keep your fingers crossed! "Cairo RADAR, Cairo, Cairo, D-EDGK, salam aleikum, request shortcut direct El Gouna, insha'allah"
"D-EDGK, approved, direct El Gouna, isha'allah"
"El Gouna Tower, D-EDGK, salam aleikum, request landing information, insha'allah"
"D-EDGK cleared to land runway 34, insha'allah"
When two pros like Markus and Achim are in town, it doesn’t take long for difficult jobs to emerge. 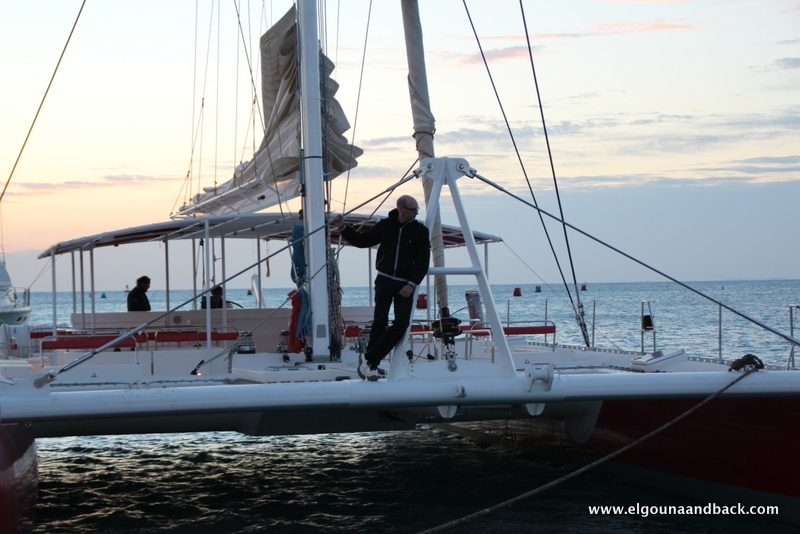 Yesterday it was about bringing Ocean Diva II, a 74 foot catamaran, from its previous harbor El Gouna to Port Ghalib (Marsa Alam), 120 nautical miles south. Due to the revolution and the subsequent decline in tourism, OD II (as friends like to call her) spent some time alone in the harbor and therefore the trip was also a sea trial. 30 knots of tailwind and arrival at an unknown marina in the middle of the night promised an interesting trip. Another goal was to try out Achim’s newly acquired trolling equipment. 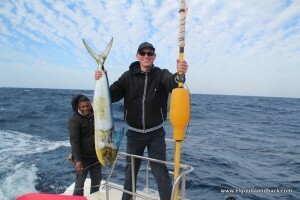 The latter was fully achieved: after about 15 minutes a 10kg thuna, two monster fish that first bent the rod and then went off with an aching jaw and last but not least a marvellous 20 kg dorade. Both were expertly cut by Khaled and served as the traditional welcome gift for the harbor employees. Achim — economist by profession — immediately determined the return on investment for his fishing gear (4 more fish) and we are currently working on our business plan as fishermen in Egypt. The marina entry at Port Ghalib (no maps!) was quite interesting due to broken and invisible marker beacons. Markus was constantly mumbling something about life vests and dying. All in all a successful trip. Today we are heading back to El Gouna in a car. After reaching our final destination El Gouna yesterday after 13 hours of flight, we will stay on the ground today — or let's better say on the water. Enjoying the Egyptian temperatures while swimming, snorkeling, fishing, wakeboarding and relaxing. Our next take off heading north again is planned for mid next week and we will of course report here again. Harald Borras on Stuck in Croatia? Hermann Bachmann on Stuck in Croatia?